When speaking of mission, it’s important to balance our support both locally, nationally and globally. There are many needs within our own local communities. One such need is for Michigan’s Foster Children. In the summer of 2012, Vacation Bible School attendees collected school supplies and backpacks for foster children. Presbyterian Women prepared a camp kit which was given to one foster child going to summer camp. The contents of the duffel bag kit included a swimsuit, pajamas, shorts, and tops, among many other items. In November 2012, the Local Mission Committee prepared 50 College Care Packages for Wayne State University students who have aged out of the foster care system. Requests for prayers for specific foster children are now put in the church Bulletin on a monthly basis. The Christmas Jar at Festival of Tables went to help foster children. It was awarded to Rev. Kate Thoresen, Coordinator, Faith Communities Coalition on Foster Care, and contained $344.52. Kate distributed $240 to ministers at Evangel Ministries in Detroit. They are sharing their home with a homeless young mother named Rebecca who used to be in foster care. Rebecca now has three children of her own, and with this money, she was able to celebrate Christmas with her children. Kate’s friend Annette now fosters three sisters from South America who have been part of the Vista Maria program. The older sister has a 1 year-old daughter, and the other two are expecting. They received the remaining money from The Christmas Jar. Presbyterian Women purchased six sets of luggage for foster girls. Members Sue Kage and Ailsa Blunk visited a home run by the Central Detroit Community of Hope organization. This home in Central Detroit has been refurbished to accommodate up to six young women aging out of the foster care system. 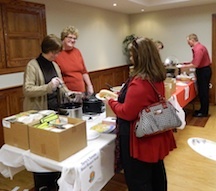 The Board of Deacons and the Local Mission Committee sponsored the Motown Soup fundraiser. Proceeds went to Central Detroit Community of Hope to purchase storage lockers for the foster girls who reside there to protect their belongings. Karlee Kage donated a Mac laptop to the CDCH home. Members Peggy Kmieciak and Chris Stirling attend meetings of the Faith Communities Coalition on Foster Careas representatives of FPCP. They, in turn, bring the needs of foster children to our congregation. Jean Krause, leader of the PW Mission in Motion circle, coordinated a trip for interested volunteers to Vista Maria in Dearborn, Michigan. Vista Maria’s mission is to deliver innovative care, support, treatment and education to vulnerable youth so that they heal, believe in their worth, and build the skills needed to succeed. We will continue to bring the needs of area foster children forward to the congregation as we become aware of them. Thank you for your continued support. For more information about FPCP’s Foster Care Support program, contact Peggy Fisher-Kmieciak at 734-953-1044.